Further to my happy post about Small Things before Christmas last year, I have a few more items to share with you. Recently I decided I would try to find the best Japanese retailers* in the city. I like the store on Queen Street, but it is so cluttered and it takes ages to go through, that I thought perhaps there may be more out there. And I was right. There is a great little store at the very last block, city end, of Dominion Road. I went on a solo trip to scout it out, and it turns out that my monster Phil & Teds will actually fit if I need it to. The store has a great range of pottery and plastic ware, as you would imagine. It also has quite a bit of personal care items too. 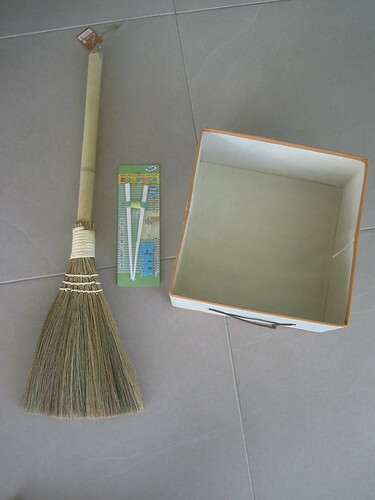 What I couldn’t resist and had to take away with me were the following items: a fold-able fabric box, destined to be animal storage; a half-pint switch broom, destined to be Miss Oh’s sweeping brush, and; a small person’s pair of trainee chopsticks. Here they all are together. 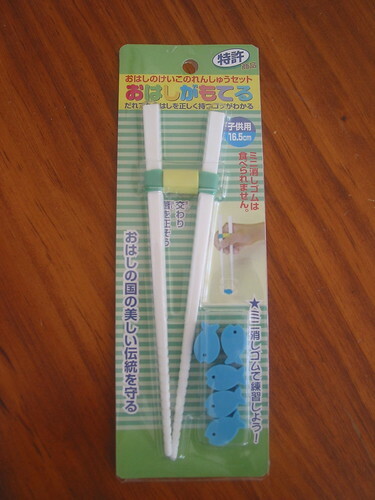 But my very favourite item of these has to be the trainee chopsticks. No child of mine will be turning up to her local Chinese, Japanese or other Asian restaurant demanding a knife and fork because “I’d starve before those pieces of bamboo got any food to my mouth”. Not in this family, you don’t. Take a close look – see the blue fish? Little rubber blue fish with notches out at tail and mouth, just for little fingers to practice on. The tips are grooved as well, to help grip things that aren’t little blue rubber fish. The concept couldn’t be simpler – two sturdy rubber bands helping keep the hands from flinging the sticks in all directions when doing a pincer move on a piece of food. And at a whopping $5 I just had to part with some cash. All up this batch of Small Things set me back an amazing $13. Just for the record, I did let Miss Oh at the chopsticks and fish just to see what she would do. She liked them and wanted to play with the fish, but her hands are still too small to manage to go around them (even after adjusting the rubber band down the sticks a bit) and open them wide enough to use well. Still, I’m thinking that with all the other Montessori inspired games and activities that we are doing which impact on the hand, it’s motor control and strength, we’ll maybe have them worked out before the year’s end. It seems to me to be a similar action for the hand as using scissors. The only difference is the engagement of the fingers directly with control of the chopsticks rather than slightly less finger and more hand with the scissors. I guess I’ll be watching the scissor control as a way of knowing when the chopsticks may be the next thing to introduce for her transfer activities. So, that’s my February Small Things. Are there any small things making you happy? Those sticks sound really cool , wish i could work them . My nails grow fast , hard and long still can’t crab them if i try . Have always had them in the draw still can’t work them , love the food .